We use the Contents pane to manually assign an initial coordinate system when importing from a format that does not specify the coordinate system. 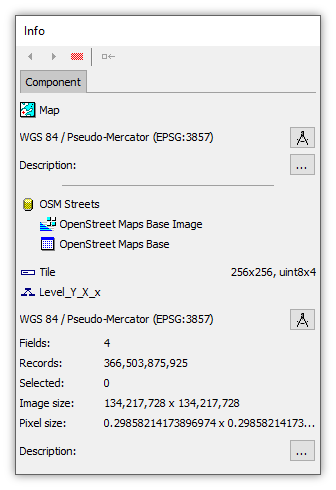 Consider a project where we have created a new data source using the OpenStreet Maps imageserver as a background layer. We have also created a new map. 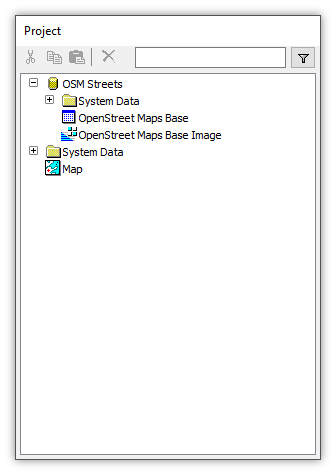 We open the map, and then we drag and drop the OSM layer into the map. 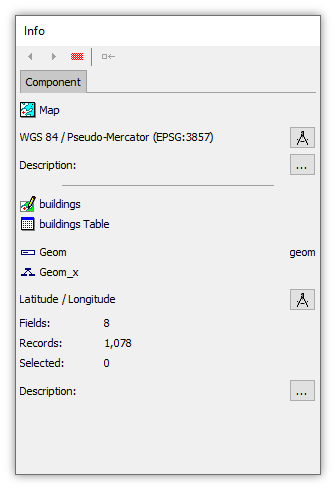 In the Component panel of the Contents pane we can see the coordinate system used by the map is Pseudo-Mercator, the default offered by Manifold when creating new components. Because that coordinate system is reported in black text we know that the coordinate system has been automatically provided by the OSM data source. Likewise, the coordinate system the Map uses is also in black text because the coordinate system for the map was defined by the first layer, the OSM layer, that we dragged and dropped into the map. Because that first layer has a verified, trustworthy coordinate system specified, the map also has a verified coordinate system. Next, we import a shapefile to create a drawing, and then we add that drawing to the map. 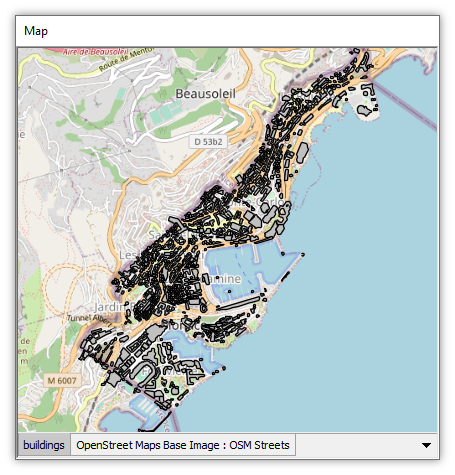 We import a shapefile that shows buildings in Monaco. However, the shapefiles we have imported to create the buildings drawing did not include a ,prj file that specifies the coordinate system to use. When we drag and drop the buildings drawing into the map it does not appear in Monaco. The Contents pane immediately shows us what is wrong so we can fix it. In the map we click on the buildings layer tab to make it the active layer. The Component panel instantly shows readouts for that layer. It shows Pseudo Mercator as the coordinate system because that is the default which is assigned to any component created from a source that does not specify a coordinate system. It is just a placeholder, and indicated as such by the red text used to display it. The red text tells us the coordinate system is unverified, it may be wrong, and we must specify the correct coordinate system by manually assigning the initial coordinate system. To do that we click on the coordinate system picker button. 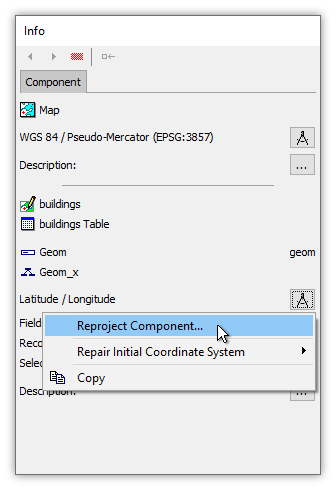 Edit Coordinate System - This launches the full Coordinate System dialog to enable choosing any one of thousands of coordinate systems. Choose one of the listed favorites - By default, Manifold always provides Latitude / Longitude and Pseudo-Mercator as default favorite coordinate systems. If other coordinate systems have been added to our favorites, those also will appear in the list as well for one-click convenience. In this example we know that the buildings drawing uses Latitude / Longitude projection. That choice is used so often that it is one of the built-in favorites. We choose Latitude / Longitude as the initial coordinate system for the buildings drawing. First, the read out for the buildings layer coordinate system in the Contents pane immediately switches to Latitude / Longitude in black text. The use of black text indicate the coordinate system has been assigned and is no longer just a placeholder that may or may not be accurate. 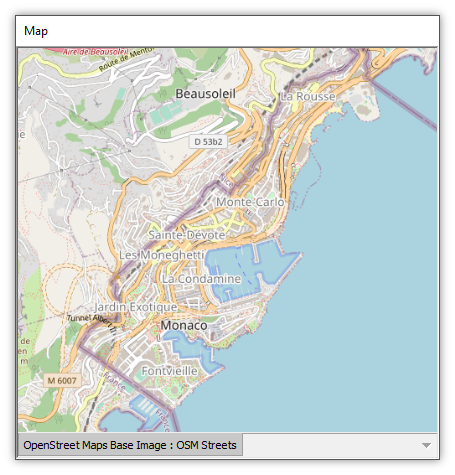 Second, the buildings layer immediately snaps into correct position in the map, showing that the buildings illustrated are indeed in Monaco. Change Coordinate System - Allows us to re-project the drawing in a routine way. Repair Initial Coordinate System - If we made an error assigning the initial coordinate system, this option allows us to repair the error. How do we know the buildings drawing used Latitude / Longitude? - The web site from which we obtained the drawing said so.